The Colors Of Indian Cooking: Yes Dianne, There Is A Rancho Gordo. Yes Dianne, There Is A Rancho Gordo. No sooner had I put a Facebook notice up about my trip to Rancho Gordo, then I had a message from old Santa Monica pal and Kensington Dog Park crony Dianne Lange, asking me if Rancho Gordo was a real place. She'd thought it was just a bean company. Yes Dianne, there is a Rancho Gordo and it's great! I'd wanted to get over there for quite a while. After meeting Steve Sando a couple of weeks ago at the Epicurian Connection here in Sonoma and buying and cooking some of his beans, I decided to see for myself what this mystical bean palace in Napa was all about. There was also another reason. When I lived in LA full time, I haunted a place called Surfas. It was for me bar none, the greatest restaurant and culinary supply store I'd ever been in. I could be found there most weekends and before any studio meetings that were nearby. It's just down the road from Sony Pictures which made it very, very convenient. Every time we go to LA on business, I make a stop there and bring back what I need. I'd been looking for something similar here without going all the way to San Francisco or Oakland. I'd heard about Shackfords and was eager to get over there and see it for myself. While not as large as Surfas by any means (after all this is Wine Country we're talking about not LA) it still had a whole lot of stuff a cook might want at pretty good prices. After examining everything, I made my purchases and we set off to find Rancho Gordo, which wasn't as easy as I thought it would be. I knew we weren't far from Rancho Gordo, so I decided to consult Lord Google and the GPS on my iPhone. Lord Google directed me to Industrial Road. I found myself passing trailer parks and empty spaces. According to my Google directions Rancho Gordo was somewhere near a spaying and neutering clinic. Hmmm, I thought. Both Paula Wolfert and Judy Witts Francini have given cooking demos out here. That must have been interesting for them. Pretty soon I found myself in an empty parking lot near a deserted storefront, part of an industrial block. 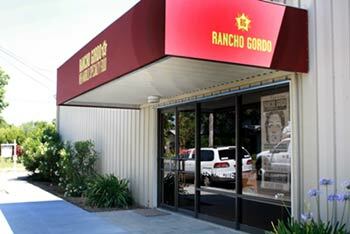 There was no Rancho Gordo, Lord Google was...WRONG! I quickly whipped out my iPhone and called Rancho Gordo where Linda directed me to the proper address. It turned out to be just a couple of blocks from Shackfords! We arrived at the proper address in a few minutes and entered a wonderful world of heirloom beans, grains, corn, cookbooks, chocolate, Mexican movie posters from bygone days and clay pots. I was in bean heaven. Steve Sando has gathered the best of the lost world of beans and made them available to everyone. I chatted with Linda behind the counter about cooking and food, and she told me Diana Kennedy was going to be visiting Rancho Gordo soon. I grabbed my basket and selected some large, meaty dark red Ayocoto Morado beans, some Premium Crimson popping corn for Alan (no hulls, no sticky bits in the teeth!) and chocolate with guajillo chili. I can't wait to cook the beans I bought and pop the corn, and the chocolate??? The chocolate is just lucky it survived the drive home to Sonoma, it's that good. So Dianne, when you visit Sonoma next time, we'll take a bean tour. All you have to do is click your ruby slippers together three times and say there's nothing like beans, there's nothing like beans, there's nothing like beans. Both stores look like so much fun for a foodie. Google has gotten me lost before, too. You are lucky you had a backup plan! The GPS is often wrong, but I am glad you finally made it to your final destination! Both stores look like so much fun for food obsessed folks. Can't wait to see where the beans end up! You are so extremely lucky to live in an area you can find or know someone that can find everything and anything...cant wait to see what you make...oh and no way did they chocolate make it home, I dont believe it, you must have ate one already lol kidding! Looks like you had so much fun. I think I can look forward to plenty of dishes with bean in the near future. SURFAS? You HAD to say SURFAS!!!! I instantly got homesick for Culver City (my hometown) and my beloved Surfas. I have to admit I liked it better before it moved and got all fancy looking. I wanna go bean hunting with you! Oh yeah, it has been about a month since I mentioned this but tell Paula I love her. I'm so sorry I missed you! It looks like Linda took care of you, though. Glad you had a good time and I can't tell you how much I appreciate your support! Yes..one time I wound up in someones vineyard just using the GPS..I figured the road had gotten really narrow and where did all the grapevines come from?? At least the Google did take me to Steves' old store..it was easy to get back to where I should have been. It's hard to get too lost in Napa. I loved your store and for sure I'll be back. We popped the Crimson Corn yesterday, very impressive. me too..I keep looking for bigger and bigger ones. you know how big Surfas has gotten!!!?? I was knocked out when I was down there last year, I couldn't believe it. It's a restaurant also now! Like the informative read Kathy. Keep it up. Best wishes. gasp, i didn't know people made popcorn without the hulls!?! this is the reason why i rarely eat it, because i'm picking out the hulls from my gums two days later and after at least 6 brushing sessions. i must have some! I love stores like that, could spend the day there. How does the gourmet popcorn compare to the regular kind?